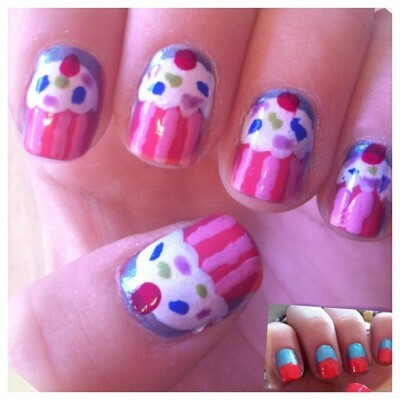 Cupcake nails — Free Makeup Samples and Weekly Tips — from Makeup Chick! These cute cupcake nails turned out great! They took a few steps to do, so you need some patience, but they are well worth it. Before you start, give your nails a clear base coat. Then you are ready for the design. First, paint the top part of your nail a background color that will contrast with the frosting. We chose a blue color. Then paint the bottom half of your nail with the cupcake paper color. We chose a red. See the inset photo at the left. When that dries, you can add the stripes fro the cupcake paper using a dotting tool or a very thin brush. Use a similar but contrasting color. We used pink. Next, add the white frosting using a thick layer of nailpolish. When that dries, you can add different colors for the sprinkles using a dotting tool. Finish it off with a cherry using a dotting tool and red polish. Too cute! See more designs and fun stuff for kids on my Youtube channel! Did you know that Amazon has tons of cool makeup products?